For long pile fluffy plush, we recommend a vigorous shake-out to freshen your puppet up if it gets flattened or crushed. 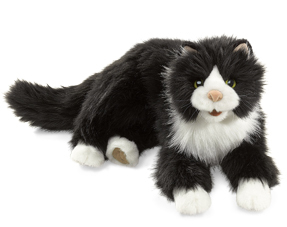 Short pile plush can get grooming with a wire or coarse-bristled brush, like a pet grooming brush. By brushing with – rather than against – the fabric grain, you’ll quickly restore the quality and realism of the animal’s fur. BUT NOTE THIS WARNING: a strong brush is no friend to the eyes and ears of an animal. Both can be scratched and damaged if care is not taken to avoid these sensitive areas. The only feeding your puppet requires is lots of love and snuggly fun! If you'd like to see product demonstration and puppeteering videos, click here! 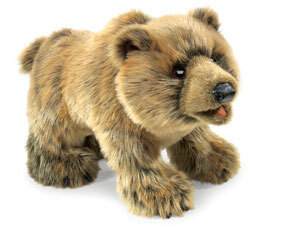 Short Hair plush – can be brushed with a wire pet brush to fluff up the plush but avoid the eyes ears and nose.